Mokuzai Studio has brought to the Nintendo Switch one of the most challenging yet forgiving platformers in recent memory. The game challenges the player to make frame perfect movements and react quickly in tight places, but surprisingly none of these challenges feel impossible. There’s also an amazing soundtrack that makes the levels all the better and as an extra bonus, kuso also includes all the levels from 2014’s LOVE. kuso is Mokuzai Studio’s second game, the first one being LOVE. This tough as nails platformer challenges players to complete 41 unique levels, each one adding in a new mechanic or deadly trap. The variety of these levels successfully prevent the game from feeling dull. There’s no story or lore to kuso, the game puts the player right into the action. This isn’t an issue since there’s no need to give a narrative or explanation as to what’s happening. The player quickly learns that they must avoid deadly traps and do precise jumps to pass onto the next level. Players can move horizontally, jump and do a short hop. What’s unique to this game however, is the ability to place a checkpoint wherever you want. There’s an unlimited amount of checkpoints, so the player can save anywhere. However, these can be destroyed, so it’s best to place it in a safe platform. If a checkpoint gets destroyed and the players dies, it’s back to the beginning of the stage. There’s also the ability to respawn at your checkpoint with the press of a button, which comes in handy when stuck somewhere you don’t want to be. Level design is fantastic, and there’s not a single one I didn’t enjoy. They’re challenging and creative. Most levels add something new to the gameplay so it’s always fun to see what’s next. There’s some secrets and collectables, but they’re minimal. I would’ve loved if the game had a collectable or two in each stage for the completionists or those looking for an even greater challenge. There’s two main modes in kuso. First off there’s the main game which includes Unlimited, Arcade and Hard, as well as Speedrun. These modes include the same levels, but the number of checkpoints given to the player changes. Unlimited is the only mode that includes an infinite amount of checkpoints. The other mode is 2 Player VS, which is a race between two players for who finishes first. This mode is great since players challenge themselves to play better and faster. Players can choose to play either kuso, LOVE, or both. The option to play the two games separately is a nice feature. Visuals are minimalistic, with simple pixelated designs to both platforms and the environment itself. There’s only ever two colours on screen, white which means the object is interactive (either platform or traps) and the background colour. Colour pallets for the background change between stages, which is a nice touch. James Bennett wonderfully crafted different pieces of music for each level. All 41 stages include a different tune to accompany it. The soundtrack is top notch and the variety between the different themes is outstanding. Some songs are fast and intense, while others are slow and relaxing. Some traps also move at the pace of the rhythm. There’s not a lot of negative things to say about kuso. One small detail that bothered me was how some objects had black and white colours that would blink rapidly, hurting my eyes if I looked at them for too long. Another small issue is how the game isn’t very lengthy, my first run took around an hour and thirty minutes. With solid controls and a great basis for gameplay, I was somewhat disappointed there wasn’t more to do after finishing, aside from replaying the game several times. kuso is simply amazing. The controls are accurate and every movement feels precise, the game challenges the most out of my platforming skills, visuals are minimal but work great and the soundtrack is excellent and varied. Players will not only enjoy kuso, but its predecessor LOVE as well, all of it for less than $5. 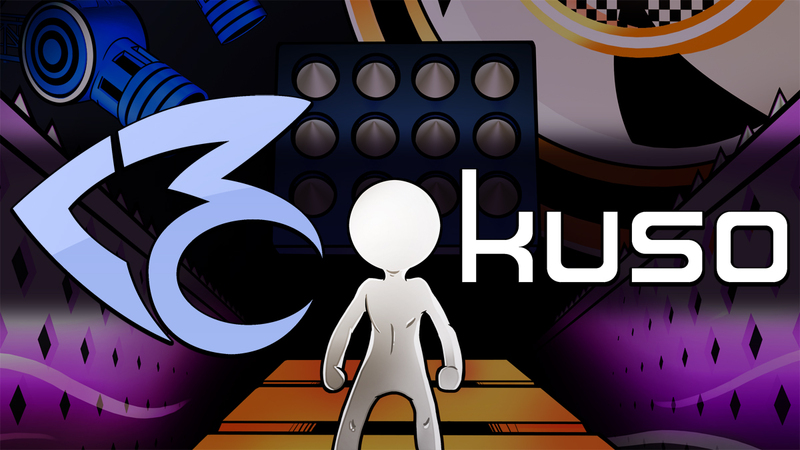 If you’re looking for one of the most challenging platformers on the Nintendo Switch, look no further than to get kuso.